ATLANTA, Ga. (March 31, 2017) – Motorists traveling through Georgia are being asked to avoid I-85 in Northeast Atlanta, as the highway is closed in both directions. A section of the northbound I-85 overpass collapsed Thursday night, near Piedmont Road. Investigators blame the collapse on a fire that broke out underneath the overpass. Troopers responded to the fire and stopped traffic before the collapse occurred. As a result, no injuries were reported. Officials have since determined that southbound sections of I-85, and possibly other adjacent sections, were damaged in the fire and would need to be replaced. According to Georgia DOT, it will take several months of construction before the roadway will be open to traffic.. Click here to read the full report. Both north and southbound lanes of I-85 are now closed from the I-75 connector to GA 400. See detour maps below. Authorities say there is no timetable on when the bridge will be repaired. Some other surrounding roads are also reportedly closed, so motorists are urged to avoid the area if possible. If Atlanta is not their final destination, travelers are asked to completely avoid coming into the city. All thru traffic should take I-285 around the city. 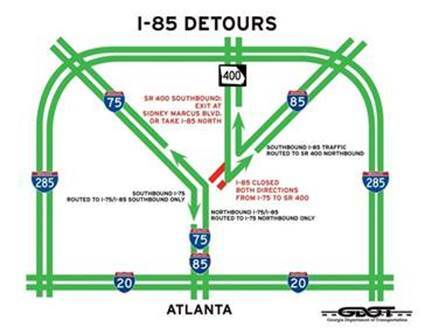 The Georgia Department of Transportation (GDOT) encourages motorists to use alternate routes and visit 511 for the latest travel information. Check traffic conditions through local media outlets before heading out. Always travel with a cell phone and car charger. Have a full tank of gas. Road closures also apply to our tow truck drivers as safety is the key for everyone. If you find yourself in an unsafe situation, please contact law enforcement. About The Auto Club GroupThe Auto Club Group (ACG) is the second largest AAA club in North America. ACG and its affiliates provide membership, insurance, financial services and travel offerings to over 9 million members across eleven states and two U.S. territories including Florida, Georgia, Iowa, Michigan, Nebraska, North Dakota, Tennessee, Wisconsin, Puerto Rico and the U.S. Virgin Islands; most of Illinois and Minnesota; and a portion of Indiana. ACG belongs to the national AAA federation with more than 57 million members in the United States and Canada and whose mission includes protecting and advancing freedom of mobility and improving traffic safety. Motorists can map a route, identify gas prices, find discounts, book a hotel, and access AAA roadside assistance with the AAA Mobile app for iPhone, iPad and Android. Learn more at AAA.com/mobile. AAA clubs can be visited on the Internet at AAA.com.